The GPRV4, specifically made for sport / road racing bikes. We've taken our proven fluid control technology and squeezed, trimmed, and lightened this model up to be exactly what the racers want. Smaller, lighter, faster. A large dial with a definite "no-slip" grip that locks into place with a positive "click" at 20 settings. Approximately 30% lighter than the GPR original Version 1. Available now in Black / Red and multiple color combinations in the fall of 2007. Developed extensively in the World Superbike paddock and the AMA Roadracing paddock during the 2007 with incredible results. Shorter fluid ports, new valving, quicker reacting to high speeds. Two wheel tuners "Brappy" award for "Best Road Racing Product of 2007". "Massive improvement over the original model" Superbike Magazine 2007. Used by muti- time "Isle of man TT" winner John Guinness, Ireland's Ryan Farquhar, BSB Team Padgetts Honda, and BSB Team Hawk Kawasaki. Australian Superbike Championship wining Joe Rocket Honda with Adam Ferguson and Josh Brooks. In the AMA paddock you'll find the new GPRV4 on the Corona Honda, Hooters Suzuki, Grant Matsushima's MPT Suzuki, and dozens of privateers. The list keeps growing every season for a reason...It works! It does what a steering damper is supposed to do. 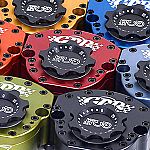 The GPRV4 dampers available to the public is the same championship wining steering damper that our race teams use. Bolt on applications only too. No holes to drill into your top clamp and no holes to drill into your frame. Light-weight mounting brackets and all in house prototyping insure a proper fit to your bike. This is the steering damper you want on your sport bike.